I'm always drawn to beauty palettes because they are often an amazing value and so convenient when you need to have everything in one handy case. The downside to palettes is when some shades are gorgeous but others are repeats in your collection or just plain... blah. 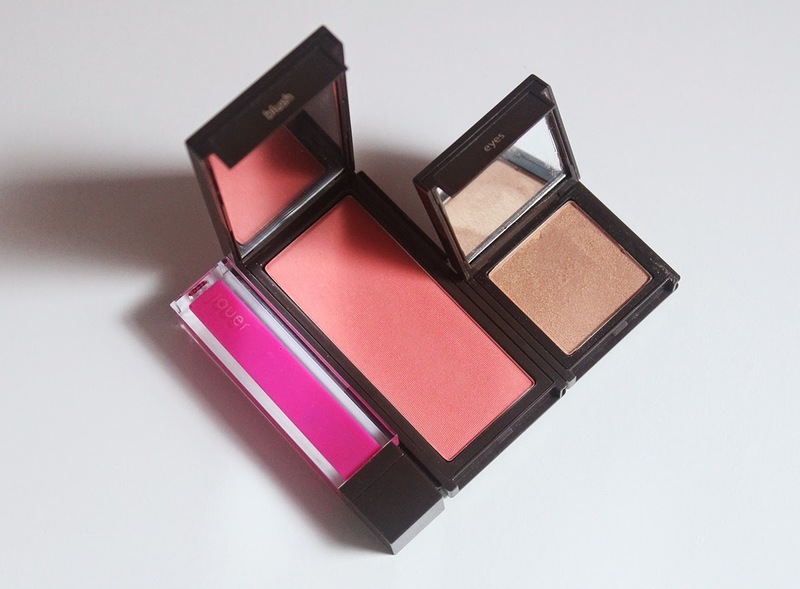 This is why the Jouer interlocking compacts are genius and a godsend for people who can be a bit picky. I've had the Jouer Lipgloss in Birchbox Pink for over two years now but I've never had any other compacts to attach it to. Recently I was given their Powder Eyeshadow in Caramel and the Powder Blush in Peach Bouquet* to finally expand my little palette. 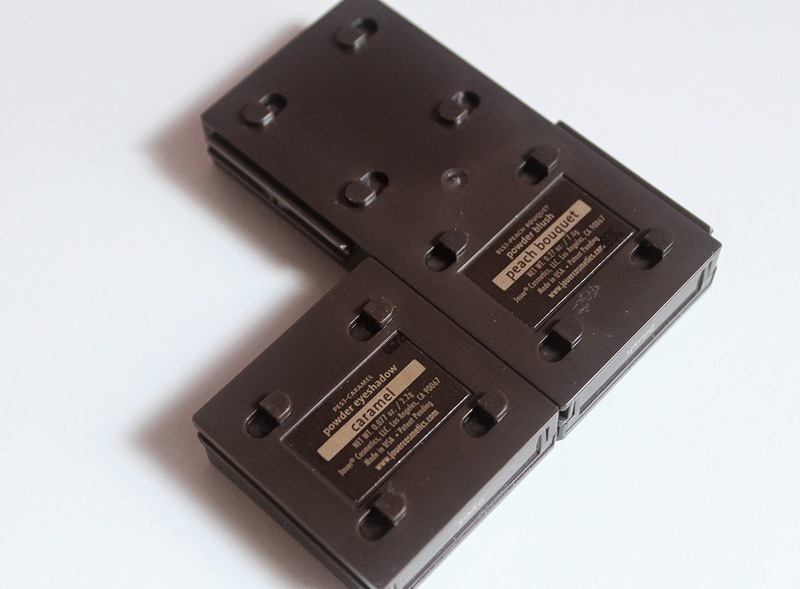 As you can see from the photo above, the compacts can click together side by side or back to back. The interlocking mechanism is easy to use and pretty sturdy so you don't have to worry about anything breaking off. However, the one caveat I found is that if you have two mini squares clicked onto the back of a longer compact, you cannot open both of the small squares at the same time because there isn't enough room for the lids. Here is what the products look like separately in case you want to only bring one piece with you on the go. The little ridges on the sides of the compacts aren't too obtrusive or unappealing. The dark brown plastic casing feels substantial and is a nice contrast to the usual black casing. The texture of Jouer powder makeup is very smooth and soft. The colors are perfect for those who like subtle makeup and great for ladies (or gentlemen) who work in conservative environments. 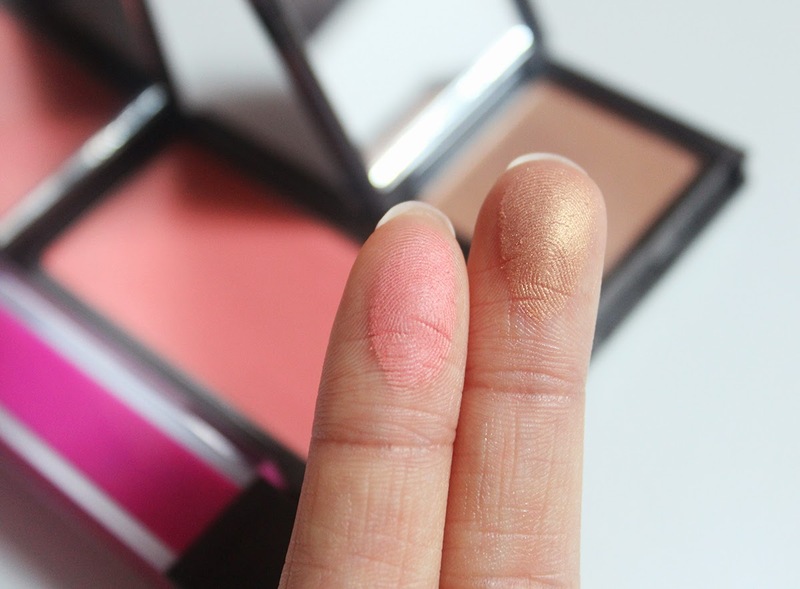 The pigmentation is certainly on par but you won't get the extra buttery goodness that you might find with Urban Decay or Nars. Jouer powders blend easily, almost a tad too easily, so use a light hand when sheering out color. I really love the color of Peach Bouquet and think it's the perfect everyday color for most light to tan skintones. Caramel swatched a lot more gold than I thought it would because it seemed more like a mid tone brown in the pan. The fine shimmer in this shadow makes the eyelids glow and I love this all over the lid for a quick look. The color does translate a bit warm so it can look almost orange in a not-so-flattering way but I can easily counteract that by adding in a cool matte brown to the outer corners of my eyes. I have been wanting to try Jouer's products for several years now and their formulas do not disappoint. I love the build-your-own concept and look forward to adding maybe a matte eyeshadow and cream tint and highlight to my palette. I also briefly met Christina Zilber, the founder of Jouer, at a Birchbox event and she was really sweet as well. Bonus points for down to earth founders! Have you tried any Jouer products? What are your favorite makeup palette brands? 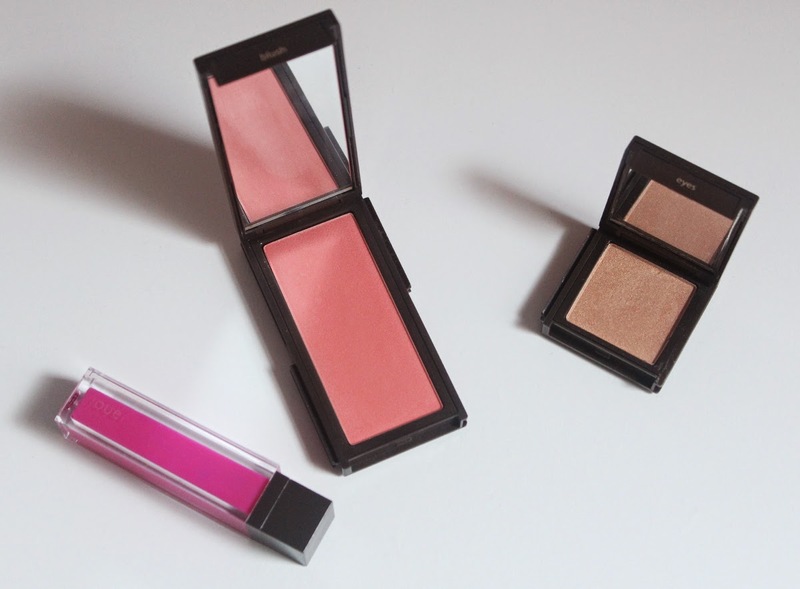 *The blush and eyeshadow were given to me as gratis for my work at Birchbox. I bought the lipgloss two years ago with Birchbox points I had accumulated from my subscription that I paid for myself. All opinions are 100% my own honest thoughts.